The term obesity is applied to excessive deposition or distribution of fat in the body. Excess of fat is a disadvantage rather than as asset; it may lengthen the waist line, “but shortens the life line” of the individual by imposing an extra burden on the cardiovascular system. Normally, men need up to 2,500 calories daily, while women and other inactive men need only about 2,000 calories daily. However, pregnant and nursing women needs about 300-500 more calories daily. Obesity is present in women whose body makeup is over 30 percent fast and in men whose bodies contain over 25 percent fat. Optimum body constitution is less than 24 percent body fat for women and less than 18 percent for men. Consuming more calories than are actually burned causes obesity. However, this imbalance between calories in and out may vary from person to person. Obesity runs in family. For instance, children of obese parents are 10 times more likely to be obese than those children whose parents have normal weight! Our heart is continuously working and if someone is overweight; in that case, you can well imagine how much more the heart has to work. Hence, obesity causes the heart to work even more and can lead to heart attack. 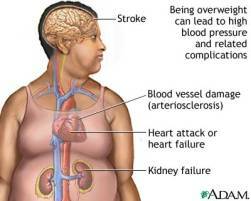 Why Obesity causes Heart attack? Obesity causes the wall of the heart's left ventricle to become thick which if persists can finally cause heart attack. It also increases the chances of developing other risk factors for heart disease, especially high blood pressure, and high blood cholesterol. Arthritis of weight bearing joints. Excess risk during child birth – complications. Sleep disorders, increasing sleep apnea. Excess risk of injury and falls. Shortened life span (up to 20 percent). Obesity has become a very common problem all over the world. The rate of obesity has doubled in the last two decade. At present, every one in five is obese. Since obesity is so common and produces so few symptoms in its earlier stages, it remains a personal but socially acceptable problem for most patients; scarcely seeming to merit the major effort involved in its correction. The basic requirement for the treatment of obesity, whether it occurs in infants, children or adults, is the regulation of daily intake of energy sources. In first instance an ‘unweighed diet’ is used, but if this is not effective, the stricter discipline of a ‘weighed diet’ may need to be imposed for a time. For a previously obese person to maintain a normal weight often demands persisting indefinitely with some dietary restrictions, even when the target weight has been attained, the majority of patients are unable or unwilling to sustain the effort required. Most obese patients lead sedentary lives and the full extent to which urban and industrial life restricts activity is only now being realized. There is little doubt that the health of most obese people would be improved by exercise, e.g. walking, swimming, gardening, provided it does not exceed their cardiovascular capacity. All obese patients should be advised to walk for at least an hour a day, always provided they are fit to do so. Regular daily exercise is much more valuable than episodes of activity at the weekends. Cholesterol is an important part of a healthy body. But as it is said “excess of everything is bad”, similarly excess of cholesterol is also very dangerous. The saturated fat in our diet forms cholesterol. These are the animal fats such as meat (beef, pork, lamb etc) and dairy products (milk, butter, cheese etc.). It is a natural ingredient of some foods such as eggs, liver, kidney, prawns and fish. You should reduce the intake of these to one portion and maximum 3 eggs a week. Extra calories are stored in body as Triglycerides. It leads to bad health and many diseases. You should try to avoid too much intake of calories. Limit your sugary treats to three times per week maximum. You should choose calories you can chew ---- that means drinking only calorie-free beverages (except for milk). You should cut your fat intake in half. If you’re not currently using skim milk, go down one level of fat content in the milk you use. For instance, if you currently use two percent, use only one percent. Try to use unsaturated spreads as per your taste e.g. olive spread etc. Limit your snacks treats to once or twice a month. products such as skimmed milk, low fat cheese and diet yoghurts. Avoid high fat products such as chocolates, cakes and biscuits. Include two to three portions of oily fish (tuna, salmon, pilchards, sardines and herring) in your diet. Try to use sweeteners instead of sugar. Use sugar free products such as, diet yoghurt, fruit, sugar free whips and sugar free jelly. Try to snack on plain biscuits, tea, coffee, fruit or diet yoghurt instead of sweets, chocolates and cakes. Try to drink only sugar free beverages. Eat at least two servings of fruit every day. Include two servings of vegetables with lunch and dinner, for a total of at least four servings per day. Choose one to two servings of foods made from whole grains with every meal. Eat at least one meatless lunch and dinner to reduce fat, increase fibre and get you into the habit of building meals around whole grains, beans and vegetables. Salt pumps the extra fluid around the body and thus increases the work for heart. Therefore, to prevent heart diseases you should limit the use of salt. Check and taste the food before adding more salt to it. If you added the salt in your food while cooking, do NOT add it again while eating. In order to increase the taste of your food, do not run for salt. Try to add herbs or spices like pepper, garlic, lemon juice, sage or thyme. Try to avoid salty foods like chips, bacon, cheese and processed food. Remember to enjoy what you eat!